It's the latest in backup software; and if done properly, it can serve as the ultimate no-brain backup. But that's a very big if. Some plug-in-and-back-up setups have major flaws. For instance, even though the Seagate Replica drive claims to back up all partitions on a drive, PC World couldn't get that feature to work during our review. You can load Rebit software on any external hard drive. But Rebit offers the easiest backup of all. You don't have to decide which files and folders to back up. The first time you plug in the drive, it backs up everything on your regular hard drive--data, applications, even Windows. Because Rebit backs up everything, you can recover your entire system after a hard-drive crash or other disaster simply by booting from a special CD (you can download the .iso file from Rebit's Web site when the time comes). Rebit makes recovering a specific file easy. Right-click a file in Windows Explorer, select My Rebit, and pick a version of the file from your backup. Or double-click the Rebit system tray icon for the Windows Explorer-like Rebit Browser. Rebit is designed for real-time, around-the-clock backup. The program backs up a file as soon as you change it, so you never have to think about backing up. Of course, constantly creating backups will slow the computer noticeably. And keeping backup media plugged into your PC 24/7 puts it at risk of power surges, malware, and thieves because your backup is as exposed to those threats as your primary system is. Fortunately, you don't have to keep the Rebit drive plugged in. If you can remember to plug it in once a day, it will back up everything that has changed since you last had it attached. 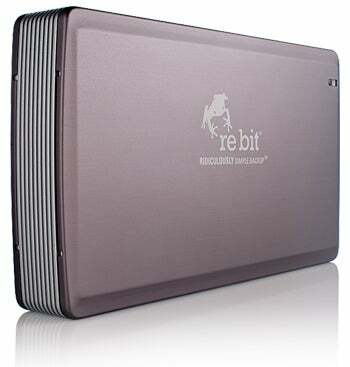 Rebit portable and desktop drives are available in various storage capacities. The company recommends buying a drive that's at least 25 percent larger than the one you want to back up. But don't get too big a drive: You can't use a drive running Rebit for any other purpose, such as extra storage. Other simple backup drives, like HP's SimpleSave, do allow you to use part of the drive for backup and part of the drive for extra storage, but HP's software can't handle versioning. Putting the drive to work for multiple uses raises other issues of data safety: The data simply being stored on the drive won't be backed up, and the files that are backups of content on your primary drive must share space with actively used data that could become infected on its own. If you already have an external drive of the right size, you can buy the Rebit software by itself for $50 (though I've seen it for less than $30) and install it on your own drive.